They were dubbed the “hottest new group in jazz”, but a fatal car crash and a pesky heroin addiction cut short their time together. Even so, the world has never forgotten the magic of Lambert, Hendricks and Ross. 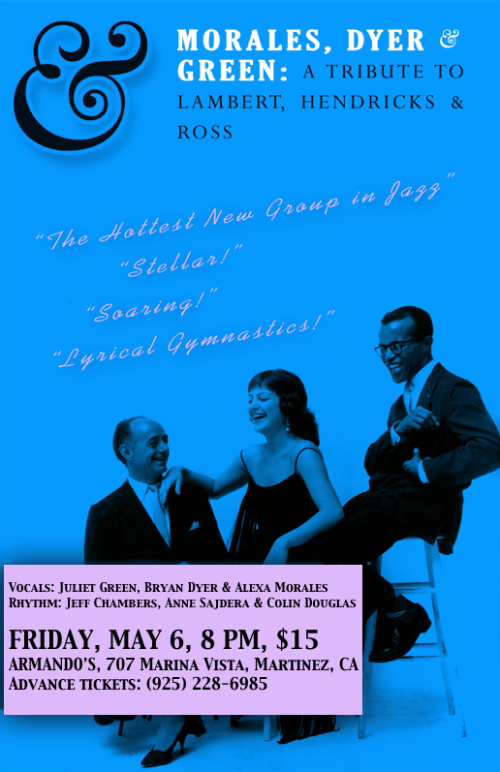 Morales, Dyer and Green is a brand new trio dedicated to performing the spectacularly challenging and entertaining hits of the greatest vocal jazz group of all time, Lambert, Hendricks and Ross. Unforgettable songs from the heydey of bebop — songs like Twisted, Moanin’, Centerpiece, Sermonette, Cloudburst, Caravan and Come on Home — will come to life with Bay Area flavor and surprising new dimensions in Jon Hendricks’ former hometown of Marin. Bandleader and Grammy-winning jazz/salsa singer-songwriter Alexa Weber Morales (Pacific Mambo Orchestra, alexajazz.com) is joined by two Bay Area vocalists, the globe-trotting, soulful body musician and bass singer Bryan Dyer and the genuine LHR scholar and witty vocalese expert Juliet Green, plus a stellar rhythm section, for a total of 7 pieces. About Bryan DyerBryan S. Dyer is a multi-talented musician (also blessed with perfect pitch) who not only sings but plays several instruments including bass guitar, percussion and piano; writes and arranges music; conducts choirs and groups; and works in television, radio and film. A veteran of some of the Bay Area’s top vocal groups including Street Sounds, SoVoSo, Slammin All Body Band, Linda Tillery and the Cultural Heritage Choir and Chelle and Friends he also performs with Zadell, Rankin Scroo and Ginger, and the R&B group D.A.P. His musical experiences have taken him to 46 of the 50 United States and around the globe including several trips throughout Europe, Japan, South Korea and Jamaica. Bryan’s talents have landed him alongside such artists as Al Green, Bobby McFerrin, Michael McDonald of the Doobie Brothers, Huey Lewis & The News and Ladysmith Black Mambazo, to name a few. Swinging standards, sparkling vocalese, sumptuous ballads and smart lyrics are the signature of Bay Area vocalist Juliet Green. Originally from Maui, Hawaii, Juliet Green has been a singer, songwriter and educator in the San Francisco Bay Area since 1991. In 2014, Juliet was not only a finalist in the Mid-Atlantic Jazz Vocal Competition, she released Think About That, an album (her second) of original songs, lyrics and vocalese. Juliet has performed in various vocal jazz ensembles, winning the SF Regional Harmony Sweepstakes competition in 1998 and 2000 (+4db), 2005 (Moodswing) and 2012 (Sing Theory). Juliet currently sings alto in the award-winning jazz a cappella sextet Ro Sham Bo. A genuine scholar of Lambert, Hendricks and Ross, Juliet has taught classes on LHR and other topics at the Jazzschool in Berkeley, Jazz Camp West and Stanford Jazz Workshop, and directs the six-time Downbeat award-winning Panache vocal jazz ensembles. She is the lead singer with the big band A Touch of Brass under the direction of trumpeter Ed Morrison. Alexa Weber Morales is an Oakland, California jazz and salsa singer-songwriter, fluent in a few languages thanks to her itinerant youth, which included schooling in Berkeley, Grenoble (France), Oakland, Philadelphia, San Francisco and Havana (Cuba). Since her 2004 debut album, Jazzmérica (produced by Wayne Wallace), she’s sung on more than a dozen studio recordings for her own & other bands. In 2010, she sang on the Grammy-nominated Wayne Wallace latin jazz album Bien! Bien! In 2011, her Kickstarter-funded, all-original third album, I Wanna Work For You, won the Latin Jazz Corner Outer Edges Award. In 2012 her singing and comissioned songwriting were highlighted on Pacific Mambo Orchestra‘s debut album. In 2013, Alexa won a Grammy along with the rest of Pacific Mambo for their eponymous, Kickstarter-funded debut — and The New York Times proclaimed the spectacular Oakland group “Unknown no more”! Alexa works equally hard as a bandleader, author, singer, composer and lyricist, and plays piano, charango, melodica and hand percussion. While she believes passionately in the transformative power of coffee, stiletto heels and microphones, she also loves disappearing in nature.